And just a low $5.99 for ANY U.S. order! Sorry- we ship to U.S. Zip Codes ONLY. We do not ship to Canada, Australia, Mexico, Europe, etc. You'll usually get your order in a couple of days! We use speedy US PRIORITY MAIL for most packages. USPS Priority Mail generally takes 2-3 business days for delivery. Please note: If your order includes only items that are offered with "free shipping", OR if your order totals under $15, your package will be shipped via U.S. First Class mail. 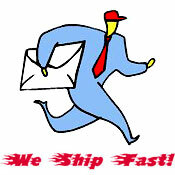 First Class Mail is STILL SPEEDY- you'll still get your order in a couple of days! One LOW price for ANY U.S. order! Most packages actually cost us between $8 and $20 to ship- but you'll pay only $5.99 for shipping. And you'll get your package FAST! The Post Office will charge you upwards of $30 extra for this premium service! Most orders will be shipped out immediately and will arrive in 2-3 days without using Express Mail. However, if Next Day delivery is needed, we can arrange that for you. Please call us at 540-832-0900 if you want to pay for Express Delivery.